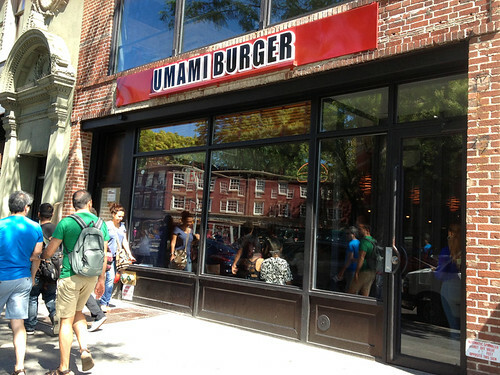 Apparently the recent (just 4 weeks ago) opening of Umami burger in NYC is a big deal – I had personally never heard of the California-based burger chain before, but I did hear people excitedly sharing rumors a few months ago, in anticipation of it’s NYC debut. But then I forgot about it, until my friend Evan worked on a video for Zagat TV about the popular burger place. All the burgers featured in that segment are meat-burgers, unsurprisingly. 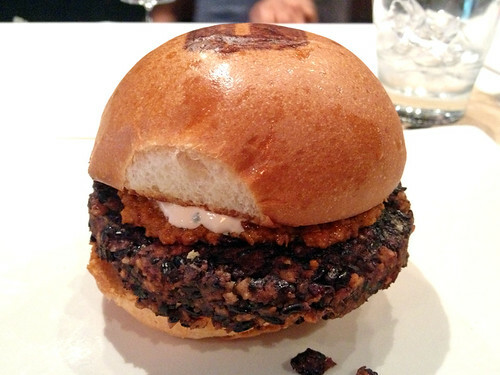 But Umami has a veggie burger too – and I felt inspired to go try it... assuming, of course, the wait was not 3 hours as I had heard it rumored to be! I was in luck – I had a couple hours to spare before a meeting, so when I showed up just before 2pm, the wait for a single spot at the bar was only about 10 minutes! Couples arriving at the same time were told the wait for 2 people would be about 30 minutes. Excited, I sat down at the bar, ready to place my order – from the “Un-Beef” section of the menu! 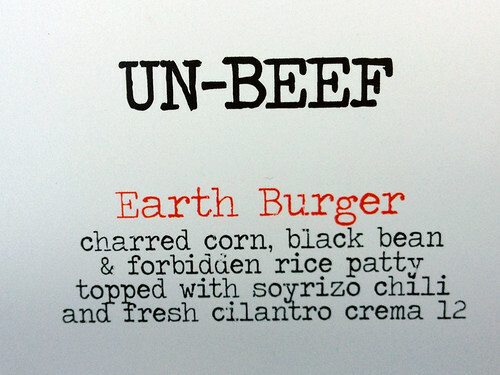 But when I told the waitress I wanted the “earth burger”, she said “we don’t have any left today”. My heart skipped a beat. She must have noticed how devastated I looked at this news, because she then said “Let me double check that though...” and hastened off to the kitchen. When she came back, she said “We have two left!” and I breathed a sigh of relief. I wonder if these veggie burgers are proving more popular than they had anticipated? 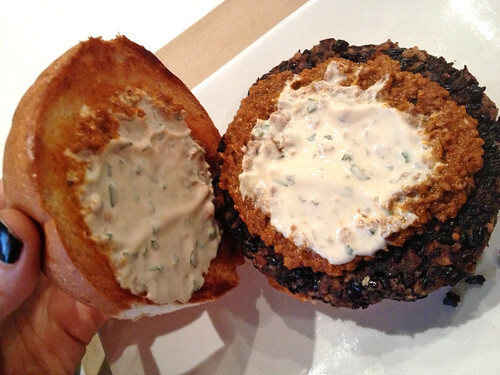 The bun was deliciously light and sweet – almost like a pastry. Not soggy at all, and not too thick or dense to bite into, but it still held everything together well. The toppings were delicious – I had never had a burger with chili on it before, but this soyrizo chili was a surprisingly a great addition, and gave it a great spicy kick. The “fresh cilantro crema” didn’t really add much flavor for me, personally. But the guacamole beneath the patty was a nice, cool, creamy note to balance out the spicy chili (and a surprise element, since it wasn’t listed with the other toppings on the menu!) The whole thing was a really awesome flavor combination. Both the sauce and the bun contain dairy, although the waitress told me they offer a lettuce wrap instead of the bun, if you request it (and you could order the burger without the crema topping). 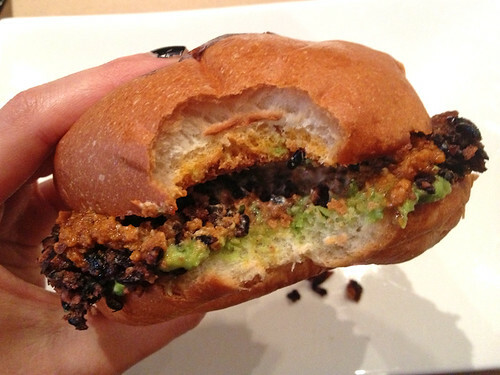 The patty, however, is vegan – an earthy blend of black beans, forbidden rice, and charred corn (although I didn’t really taste much of the corn among the beans and rice). It fell apart a bit, but was large enough that even after pieces fell out, there was still a substantial amount left between the buns. 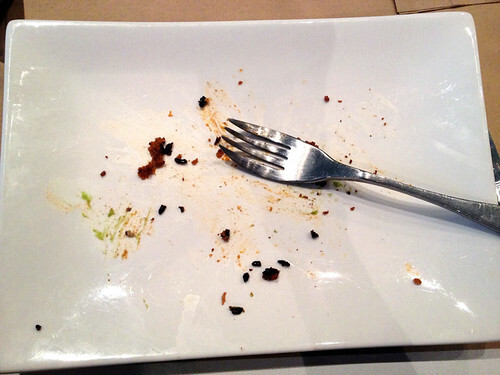 And I ate the fallen chunks with a fork, because they were too tasty to abandon. Ooh, thanks for doing this review! 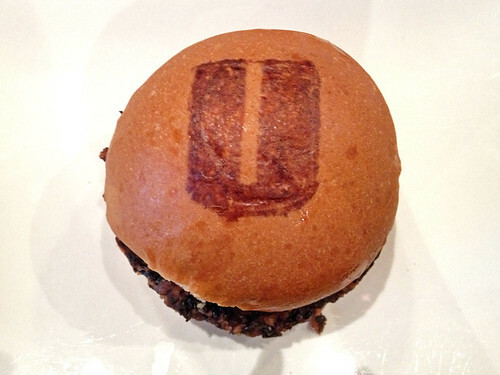 As someone who recently transplanted to California, there's a Umami a few miles from me in downtown Palo Alto. Will have to check this out.